Protect mystic secrets and don’t let the hidden treasure to be found by enemies, so join the Guardians of the Monastery and drive them off with Wilds, Multipliers and Free Spins. During the campaign, there is a nice jackpot prize of 2.000 coins to be scored on the setting with 5 reels, 3 rows, and 20 fixed paylines frequently utilized by Edict. 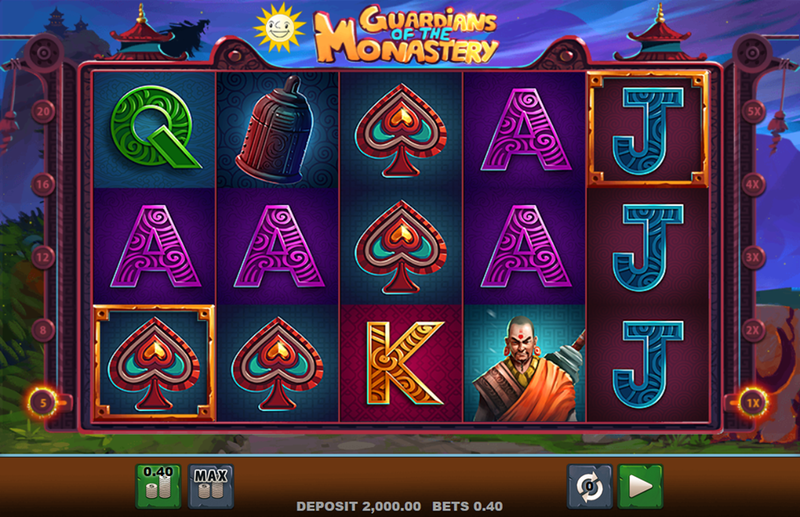 Find out all the winning tips after reading the Guardians of the Monastery slot review. Want to see how Guardians of the Monastery works? Select a recommended casino site from the list below and start playing for free or real – our screenshots will give you a sneak peek! Start with a standard choice and decide will you play for fun or for the real money, where the first case scenario grants tons of demo credits to learn how to win hassle-free. The bet value goes from €0.40 up to €40 thanks to the coin denomination between €0.02 and €2. This also means that each bet costs 20 coins, so the players are advised to adjust their strategy accordingly. Also, it is possible to use the Autoplay mode and spin the reels 5 to 100 times without any interruption, presuming you have a bankroll solid enough to withstand the pressure. Symbols on the paytable representing various items you can easily associate with the monastery have much higher rating than playing cards from Tens to Aces. The monastery itself pays 2.000 coins standing side by side with the magical potion that comes with a 1000-coin jackpot for a combination of 5 of a kind. You can expect a smaller but still a decent payout of a maximum of 200 coins when 5 Aces appear on an active payline. Both Guardians are Wilds and may replace any other item to help you form a winning combination. They can’t replace bonus symbols but may move the meter up 1 level every time they show up on special positions on the reels. Also, there’s a special symbol that may randomly appear on the reel 3 and award 1 re-spin. The base game features 2 meters – one associated with Multiplier and the other related to the extra spins. When the winners reach the highest level of the appropriate meter, one of the Guardians of the Monastery bonus features will be activated. Practically, you can apply 5-level Multipliers of 1x, 2x, 3x, 4x or 5x to the line bet and score the big win. On the other side, the Freegame Meter may reward you with 5, 8, 12, 16 or 20 Guardians of the Monastery free spins. If both meters are filled, all winnings scored during the extra rounds will be multiplied 5x. 3. What is the RTP factor of Guardians of the Monastery? According to the official info, the RTP stands at 96.05% and is unlikely to vary on the Edict-powered sites. We close the Guardians of the Monastery recension with a recommendation to more experienced players to start this adventure. They can also use the Gamble option to double or quadruple winnings, which makes it all even more interesting.